Reviewed a book I've reviewed? Please comment with a link to your review. Are you an author or publisher and think I might be interested in your book? Please send the information to adventuresinreading at gmail dot com. 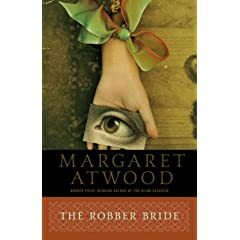 I had a love and hate relationship with Margaret Atwood’s The Robber Bride while reading it and at least twice I closed the book and swore I had given up. The Robber Bride is the story of four women and how their lives since college days in Toronto have intertwined and fragmented. Tony, Charis and Roz are three women whose lives have all been disturbed by Zenia. Zenia is an aggressor and in the battle of the sexes she has sworn allegiance to no one but herself. She is the other woman, the woman that doesn’t get or at least chooses not to follow the unspoken rules of women and men and relationships. It would be easy to dislike Zenia if it weren’t for the fact that the men she possesses – Tony’s husband, Charis’ boyfriend, Roz’s husband – are creeps for one reason or another. They are men highly dependent on the women in their lives but are simultaneously abusive towards them. These are men who take advantage of the women in their lives, but perhaps what is worse is that these are women – Tony, Charis and Roz – who know what is happening to them but decide to stick with it. Ultimately the only reason one can really dislike Zenia is because of her brutal honesty in exploiting these men’s weaknesses and forcing these women to come to terms with what they already know. The character detail and development in The Robber Bride was excruciating. It is what made me put the book down from exhaustion but also drove me to return to the novel. The character investigation into Tony’s, Charis’ and Roz’s lives goes into minute details that creates three stunningly developed characters. What I discovered was that short engagements with the book are all I could handle and any attempt to spend a great deal of time with the book was a failure. For example, the first 100 pages are divided into thirds and each section follows Tony, Charis or Roz up to the exact moment when they meet for lunch. I can’t even remember the last time I read a book so driven by character development. The idea of women protecting men from such predatory women as Zenia has an important focus in the book. But then, why should she care? At the same time, Tony, Charis, and Roz explore the idea of the unreasonableness of love. These women know they are strong and intelligent but still find themselves latched to the dependency for these men. Previously I’ve read The Penelopiad and The Handmaid’s Tale by Atwood and enjoyed both of these novels. I must confess though that I found The Robber Bride rather unwieldly, but perhaps I missed out on appreciating some of its finer points. Regardless though, I find myself a bit reluctant to return to Atwood any time soon. Other opinions: Trish’s Reading Nook.